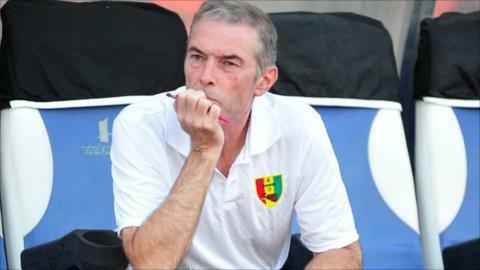 Guinea coach Michel Dussuyer on Monday became the second coaching casualty of the Africa Cup of Nations. The Frenchman announced his departure following his team's quarter-final exit on Sunday. Syli Nationale crashed out of the tournament after a 3-0 defeat to Ghana in Malabo. It ends a second spell in charge of Guinea for the 55-year-old. He took them to the quarter-finals in 2004 and also qualified Guinea for the 2012 tournament. In 2010, he coached Benin at the Nations Cup in Angola. He had been in charge of Guinea since May 2010. Senegal coach Alain Giresse departed Senegal after their first round exit at the end of his contract. The Teranga Lions were knocked out last week after losing 2-0 to Algeria in their last group match.